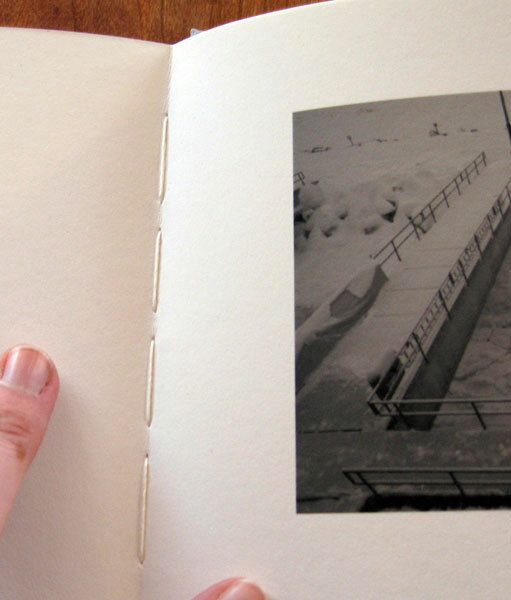 Quebec is a beautiful, curious little book made by an anonymous photographer. The photographs in the 48 page book document the Canadian province, however the book isn't accompanied by any text to lend specificity to the locations of the photographs. Paging through the small book is an intimate experience, guided by the nameless photographer there is a personal nature to these solitary, snow-covered images. This poetic look at winter in Quebec is carefully handmade by the photographer. photo-eye Blog was fortunate enough to have a contributor (who, under the circumstances, decided to remain nameless as well) discuss this work with the anonymous author and maker of Quebec. photo-eye: What reasons did you have for wanting to make this work anonymous? Anonymous: Let me start by talking about one of the inspirations for the work, which was W.G. Sebald's book The Emigrants. He's a German author, he died recently - he lived most of his working life in England but he wrote in German - I read it in translation. The first book of his that I read and was really influenced by was this book of his called The Emigrants. It's a collection of loosely connected stories about emigrants from Nazi Germany. The book is strewn with these strange, haunting black and white photographs, and some of them look like accidental photographs, some of them are like formal photographs, banal photographs. The photographs are sort of loosely connected to the stories, and you flip through the book to find out more about the photographs, like - where did they come from? Did Sebald take them himself or did he just find them? And there's absolutely no way of finding out anything more about the photographs. And that has a strange haunting effect. So when I made Quebec anonymous I sort of wanted to create an effect like that. I subtitled the work 'image anonyme' in French, and the intention there was to make the typical English speaking viewer stop and think about the phrase a little bit. If you just said 'anonymous images,' people would immediately file it away saying, "Ah OK, it's an anonymous work, we don't know the name of the photographer, etc." But there's another way of thinking about the phrase, which is, the images themselves are anonymous, the images are nameless, I have given absolute freedom to the viewer to exercise their imagination on them. So, I mean, these were some of the things that were behind making it anonymous. 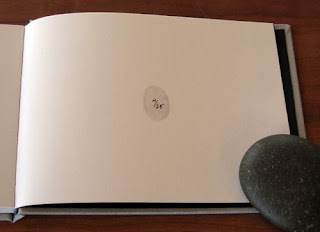 PE: You also decided to sign this work with a thumbprint, and I wondered, what motivated that? Were you trying to play around with the idea that maybe the viewer could figure out who made the images? What was your thinking there? A: Well, the images have a certain identity, there's a certain consistent style, right? So they're obviously the work of an individual, and with the thumbprint I wanted to make that point, that's a very unambiguous sign of an individual. But at the same time I wanted to move away from this trend in contemporary photography were the work is surrounded by this artist statement, the back story of the artist, and so on and so forth, which totally boxes the viewer in. I mean, there is no room for the viewer's imagination. So by stopping at the thumbprint, I was able to avoid that trap. PE: The images are all located in Quebec, but you don't point out the particulars of each image. Was that also part of trying to engage the viewer's imagination? A: Exactly, that's definitely one big idea there -- to set the viewer's imagination free. But then there's something else going on there. Frankly, especially with a few of the images, I was really conflicted. 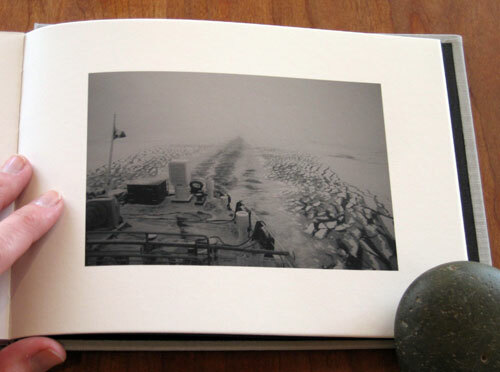 I really wanted to tell the story of the photograph - like the story of the icebreaking ferry, and how that icebreaking ferry fits in to this entire story of Quebec -- what Quebec is in my imagination. But at the same time it's what Quebec is in my imagination, if I were to talk about the ferry, why don't I talk about all the other things that constitute my Quebec? The Catholicism of Quebec, the French speaking thing about Quebec, all these remote hydro-electric plants that they have and these remote logging camps in Quebec and all these things. When I am working in Quebec they work at the back of my mind and they give flavor to the work, but all those elements are not necessarily explicit in the work itself. So to label that image 'icebreaking ferry' would be to sort of, you know, abruptly cut up the story, which is kind of meaningless to me. If you have to tell the story, tell the entire story, or let the reader go where he will. PE: As you were making the images did you have to make multiple trips to Quebec? A: Oh yeah, I've been going there for three years now, three winters now. PE: So as you go, are there people you make contact with who know who you are and know that you're making a photo project or do you let that anonymity play into making the photographs, too? A: I don't make contact with too many people. There's maybe a youth hostel way up in a place called Sept-Iles where I talked with the woman who runs the hostel, but otherwise, you know, I don't really have that much human contact. It would probably even change my interaction with the place if I had a lot of contact with the people there. PE: I'd like to ask you a little more about the book itself. One of the things that actually drew me to it is that I like smaller prints and smaller books. What made you decide to print the book this way? A: Well, one of the things is probably this advent of digital printing. Everybody wants to print big and impress with the size and everything. You know this painter who was played by Max von Sydow in Woody Allen's Hannah and Her Sisters? He's approached by this rock star who's come into money and he wants to buy something big and colorful - and the painter's very, very unhappy and storms out saying "I don't sell my paintings by the yard." So, I don't want to impress by the yard, I want to draw the viewer in. Force them to pay close attention and even the smallness of the size also goes with this small range of tones in the images themselves so they're kind of both designed to produce a more intense, more intimate experience. PE: Yeah, I think that's definitely effective. Are any of these images a series outside of the book or do you think having it in this book form is critical? A: Well, the book form has a certain rhythm to it -- you proceed from one image to the next. 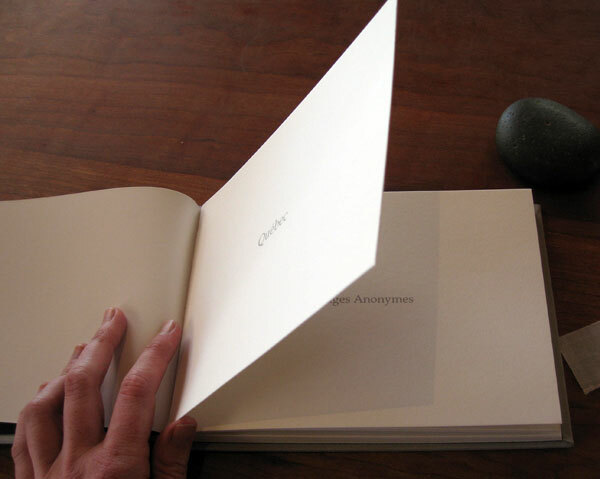 But what I print as a book is not necessarily the set I print as single images. There are some of my favorite images that are not in the book because they don't fit in the rhythm of the book. I definitely make stand-alone single prints. They're a little bigger, but that's mostly just to take into account the greater viewing distance that you have with it on the wall than with the book, but the general mood is the same. PE: So at some point do you think there'll be an anonymous showing of these images as well as other images from this Quebec series? A: Ah, well, that's not entirely in my control, right? But definitely if the opportunity presents itself, definitely. PE: You chose to print and bind the book yourself, is this something you think you'll continue to do with other work? A: Well, one of the reasons for binding and printing it myself is that that's the only way I could have absolute control over what the book looked like. And I kind of feel, in this age of the Kindle and the iPad, the only way books can survive is to become more and more bespoke, more and more custom and not the product of a print-on-demand service that gives you a choice of one or two sizes or one or two kinds of papers, right? So what I have done with this archival ink jet printing upon rag paper, I guess that could be approximated or approached in a trade edition, but it would be hard for me to find a publisher that would want to take on that kind of expense and that kind of risk. And I really love making books - especially the stitching part -- and it lets me attach a personal touch to the work that is only available in maybe darkroom prints - so it's a bit like that. So, yeah, I really like making the book and I expect to continue doing so in future. PE: Excellent. It's a very fun book to hold and read through and it does feel very personal in that way, I think because of the handmade attention. Are you working on another series like the Quebec series or are you planning one? A: Firstly, I think the Quebec series - I don't think the series is done yet. This was the third year I went there and this year I went in one direction as far as the road would take me. And I turned around there. But there is a boat that goes beyond that because there are still villages, and the only way they can be supplied is by boat. The boat runs I think ten months of the year or nine months of the year, so one of the things I want to do next year is take one of the last boats of winter. It runs mid January before it all freezes in and it stops at various small villages and again comes back. One of the things I would like to do is go with that boat and come back with that boat. And other than that I discovered other things about the place -- there are other extensions of the world that I have seen. This winter was an unusually warm winter so what I managed to see was what happens in a simulated way -- what happens just before winter sets in or what happens when winter is just leaving. There's kind of a funny in between season where there are patches of snow, patches of grass, patches of mud - and so this in between season has this particular feeling. That would be another extension of the world. So these are the other kind of ideas I'm working on. PE: Do you think all black & white still? Or some color? A: No, I think they will be black & white. It just fits the mood. Color would just be too distracting. See Quebec at photo-eye Bookstore. Read Nicholas Chiarella's review of Quebec in photo-eye Magazine. Thanks to the anonymous blogger at Photo-Eye and to the anonymous photographer and publisher. I wanted to know more about the concept and the process of putting together this self-published treasure. and I value this interview. "Quebec" is one of my favorite book acquisitions of 2010. My not so anonymous friends at P-E recommended it earlier this summer, and it was love at first sight. Thanks to Tony, copy 2 of 25 has taken a most favored place in my book collection. And, if there is a followup book (books), that would be excellent. Namaste. Being from and living in Québec, it's always interesting to see how we are seen by others. Thank you for posting the interview.